Turkey’s biggest metropolis has recently been voted the European Best Destination to visit. 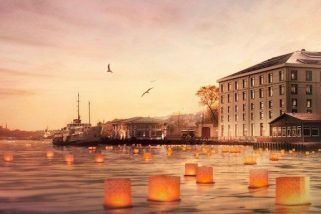 With a city as rich in history, it should come as no surprise that some of its most popular attractions are buildings built by royalty in centuries past. To help, we’ve rounded up attractions in Istanbul that belong on any visitor’s to-see list. Many of the attractions in the top 10 are free: there’s no better place to soak up some culture. Whether you prefer history or art, you’ll find it here. 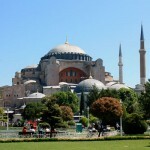 Aya Sofya or Hagia Sophia was the largest church in the world for nearly a thousand years. Following the conquest of Istanbul by Fatih Sultan Mehmed in 1453, the church was converted into mosque and today a museum with exhibits. Emperor Justinian’s influential architectural masterpiece from the sixth century is the most breathtaking building in all of Istanbul. 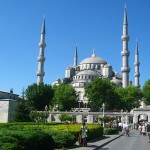 The Sultan Ahmed Mosque (Blue Mosque) is one of only a handful of mosques in the world to boast six minarets. The beautiful blue interiors inspired the name for the Blue Mosque in Sultan Ahmet. The National Mosque of Turkey was built in the 17th century which provides Istanbul with one of the most brilliant skylines in the world. The Mosque is still a working place of worship, but free to visit. 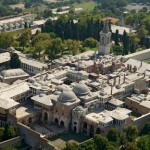 Topkapi Palace is a centuries-old palace that once housed Sultans. Topkapi Palace (Topkapi Sarayi) was built in the mid-15th century, shortly after the Ottoman conquest of Turkey. For 400 years, it was the main home of the Ottoman Empire’s rulers until Dolmabahce Palace was built in the district of Galata in Istanbul. The must-see features are the Harem, Imperial Treasury and the Istanbul views. Dolmabahce Palace located on the shores of the Bosphorus is an impressive European-style residence that was the centre of the Ottoman Empire for the last 60 years of its existence. Built between 1843 and 1856, it superseded Topkapi Palace as the main residence and administrative centre of the Ottoman Empire. Today, it is open to visitors, who can visit the Selamlik and Haremlik sections. The Süleymaniye Mosque (Süleymaniye Camii) is the largest mosque in Istanbul located on the 3rd Hill of the city. This architectural wonder designed by Mimar Sinan was built in 1550, during the rule of Sultan Suleyman the Magnificent, who wanted a monument worthy of his name, the Suleymaniye Mosque was inspired by the design of Hagia Sophia, built a thousand years earlier. The Kariye Museum also known as the Church of the Holy Savior in Chora is listed among the top 30 must-see museums in the world. This often-overlooked museum began as a chapel or church built as early as the fifth century, after which it flourished as a mosque during the time of the Ottoman conquest of Istanbul. The interior of the building is covered with wonderful mosaics and frescoes. Galata Tower is a medieval stone tower situated in the bustling Istanbul district of Galata. Galata Tower’s roots stretch right back to the sixth century, when it was built as the Lighthouse Tower by the Byzantine Emperor Anastasius. This medieval attraction occupies an important place in the city’s history, and rewards visitors with stunning views if they climb up to the top. Istanbul’s Grand Bazaar (Kapali Carsi) is one of the world’s largest covered markets, spread over 60 streets and containing over 3000 shops of jewelry, textiles, pottery, glazed tiles, bronze, leather and carpets. Grand Bazaar and Spice Bazaar are also one of the oldest of its kind, with roots stretching back to the 15th century. Its marvellous labyrinthine structure is said to attract up to 400,000 people each day. The Basilica Cistern (Yerebatan Sarnıcı) is Istanbul’s most unexpectedly romantic attraction which offers an insight into the complicated system that once brought drinking water into Istanbul. Constructed in the sixth century and then forgotten for centuries, the ancient cistern has been fitted with lights and music. Don’t miss the upside-down head of Medusa on the column. Maiden’s Tower (Kiz Kulesi) stands in the middle of Bosphorus where the two continents Europe and Asia meet. According to Turkish legend, a princess was locked inside the tower to protect her from being bitten by a snake. Over the years the tower has been used as a customs station, lighthouse and a residence for retired naval officers. More recently, the tower featured in the 1999 Bond film The World is Not Enough.